We are looking for a courageous individual (or individuals) who is inspired to be the Executive Director of the Halifax Shambhala Center. This is a unique opportunity to manifest equanimity and fearlessness in support of our community. A search committee was formed by the Pillar of Government with input from the outgoing Halifax Executive Director Michelle Munro. What do you appreciate about the center and the leadership? What are we as a community being called to be at this time? How does that inform the qualities of the next director? Those who attended reported great appreciation for Michelle Munro and the work she has done as the Director over the last several years. There were also expressions of appreciation for the center itself, and its ability to bring together diverse groups such as various meditation traditions, contemplative arts groups such as Kalapa Cha, etc. 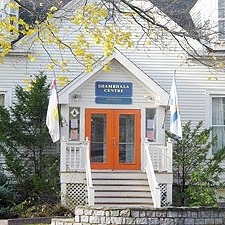 The center is a hub of community and conversation within the common goal of enlightened society. The community is also becoming acutely aware of pain and harm that has existed in our community for a long time. Some people reported feeling not welcome or respected or supported by other members of the community. Everyone who participated expressed deep appreciation and cares about the center and wants to see it continue and flourish. This has brought about a strong desire to enter a phase of community engagement to foster an environment of respect, and utilize skillful means to increase participation from a diverse and broad representation of the local community. We are presented with a unique opportunity to embrace our wisdom as we engage with social change. There is a yearning for communication and connection. The community feels the need for improving transparency and governance structures. New governance structures will need to be explored during this next period. The Halifax Shambhala Centre has maintained sound financial management based on guidelines established by the local community and it is important to continue that financial well-being. We feel it is critical to continue with a paid director. This is a turning point in Shambhala and for the Halifax Centre. This is an opportunity for a new Director or Co-directors to inspire and help create a healthy environment within which the community can move forward in a fresh direction in uncharted waters. Compensation: Salary of $35,000 per year, plus medical benefits, 4 weeks of vacation and Shambhala International program benefits. Compensation and benefits for Co-directors to be determined. Term duration: Negotiable, minimum 1 year. We appreciate any interest in the leadership of the Halifax Shambhala Center. If you are interested in this position please contact hscdirectorsearch2019@gmail.com with any questions or to apply. We will be accepting applications until May 31st, 2019. Ideally the position will start in June, 2019.